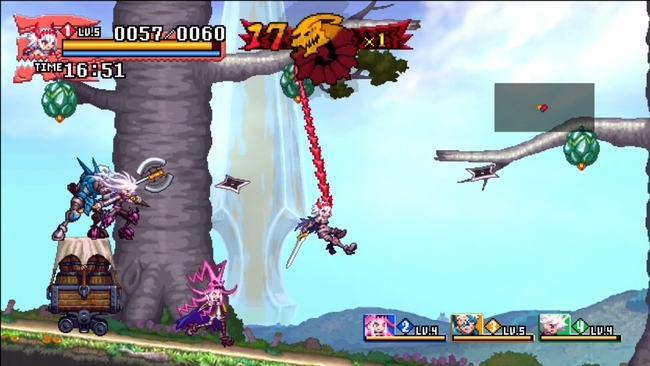 Inti Creates announced Dragon Marked for Death, an Action-Platformer/RPG hybrid, a little under a year ago - and for the longest time the company has stayed quiet about many of the specifics of the game, and when exactly it would launch after it missed its initial Winter 2017 release window. It was only this Anime Expo where the company finally opened up about the game again and gave us the updated release window - Winter 2018. Now that we've had the chance to finally try the game for ourselves, we're excited to see how the final product ends up. Players take control of one of 4 characters, members of the "Dragonblood Clan", a clan that long ago signed a blood contract with a dragon to save their lives, becoming followers of the dragon's faith and gaining the Dragon's "mark" in the process. Each of the 4 characters has the "mark" on a different part of their body, enabling different skills - but for our demo, we only had access to 2 of the 4 characters that will be available in the final game. The Empress, with the Dragon on her right arm; and the Warrior, with the Dragon on his chest. The Empress can use her Dragon to spit fireballs, charge it up for a flamethrower, and use her arm to swing across gaps. She also has a jumping slash ability, as well as the ability to charge her marked arm into a giant blade. Since each character has different abilities, there are some areas in each map that only a specific character can enter, or where a specific character's abilities are required to open up the way. Some of these routes are alternate paths to the same end destination, while others are completely optional. The Empress' ability to swing across gaps is just one of these abilities. The Warrior can use his Dragon to create a barrier around himself and his comrades, that will both protect and heal anyone within the bubble - he can also charge up a strike that sends shockwaves in either direction dealing damage, push blocks that other characters can't even budge, and use his shield to defend himself from enemy damage. It goes without saying, but the way that these two characters play are completely different. If you're playing solo, who you choose to play as will have a massive effect on how you advance through each mission - and fully exploring each level will require players to either team up with friends, or replay a level with a different character. While you traverse through each dungeon, players have to contend with both platforming challenges and a slew of enemies. Each of the levels we played capped themselves off with a unique boss battle to boot, and players are encouraged to replay with friends to search for anything they might have missed and level up. Framing these quests is a story, but admittedly what we saw of it didn't engross us very much. Thankfully, the gameplay - specifically the co-op! - was more than enough to have us hooked. 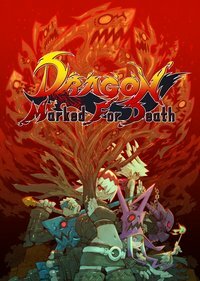 Dragon Marked for Death doesn't seem to be a very complicated, deep game; but it excels at what it needs to. Hopefully, the game keeps the charm going for the full game when it launches exclusively on Nintendo Switch this Winter.